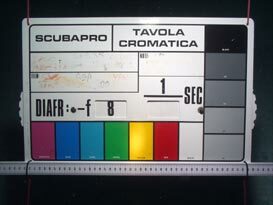 UN PWC-01, Sea&Sea WL0.56×/L, Epoque DCL-20 (Ikelite W20), Inon UWL-100. 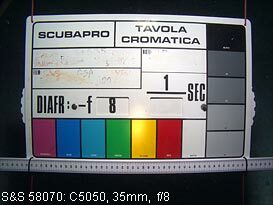 Given below are the results of tests carried out on a group of wide-angle conversion lenses of the type that can be screwed to the outside of an underwater camera housing. These lenses were all designed to work without vignetting with cameras having a 35 mm-equivalent focal length of ≥ 35 mm, i.e., they pre-date super-zoom compact cameras (but that is not necessarily a bad thing). Note that none of the lenses is a badged version of any other (i.e., they are of diverse manufacture). 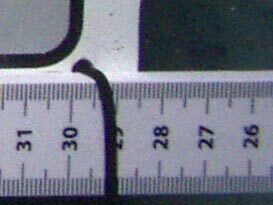 The purpose of the test, in each case, is not to measure the magnification (which is in any case available from the product literature) but to obtain a quantitave measure of geometric distortion and chromatic aberration. The reason for choosing this approach is that we want to know how well the lens corrects for the water-air boundary (i.e., the flat port on the camera housing) and for its own internal defects. The method used is to take test-card pictures and apply radial corrections using the Panorama Tools 3rd party Photoshop filter plugin, the requisite information being obtained by comparing the correction coefficients. The degree of improvement obtained after correction might also encourge some readers to give radial correction a try. Note that the correction coefficients obtained are not necessarily definitive. More time spent adjusting them might have produced slightly better results. Note also that there are easier ways to correct images than using the Pano Tools software interface. Some programs, such as Adobe Photoshop Lightroom offer simple slider controls that, although having a somewhat restricted adjustment range, are adequate for most purposes (see the computer lens correction article). 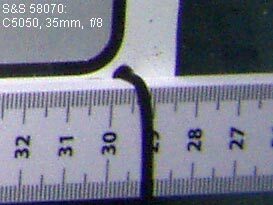 Tests were carried out using two 3× zoom compact cameras: an Olympus C-5050 (now discontinued), which was pretty close in optical design to the lens maker's target camera; and an Olympus μ410 miniature point-&-shoot (also discontinued). 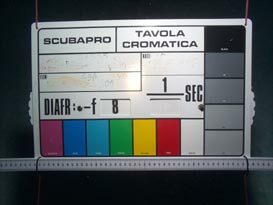 The results obtained without the use of a supplementary lens are given first for comparison purposes. Note that, in the case of the C-5050, we also determine the characteristics of the camera in air, since this information allows the effect of the flat port and the performances of the supplementary lenses to be separated. 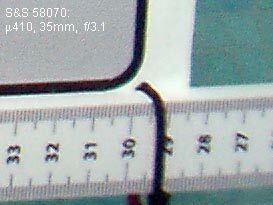 4.9Mp 1/1.8" CCD, 2560 × 1920 pixel RAW output. 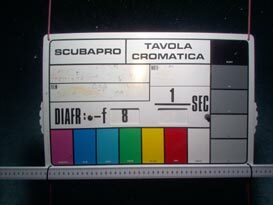 Underwater light source: Sea&Sea YS50TTL/N with Matthias Heinrichs' DA-IR-N TTL converter (internal flash switched off). 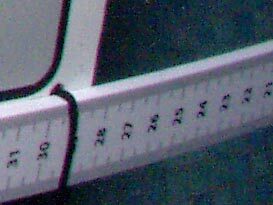 Corner details of photographs taken with the C-5050 are cropped from the 2560 × 1920 full-size image. 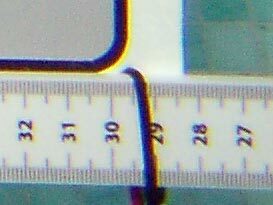 Note: The purple tinge of the ruler is due to its high reflectivity in the ultraviolet part of the spectrum (the picture was taken outdoors with no UV filter). A UV filter is not necessary underwater. Note: The illumination hot-spot in the full picture is due to the use of a torch as a focusing-assistance light. Notice that the C-5050 zoom lens set at maximum-wide (equiv. 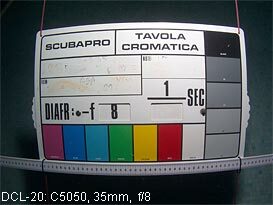 f = 35 mm) gives a small amount of barrel distortion in air, but this is almost completely corrected underwater by the pincushion distortion introduced by the flat port. 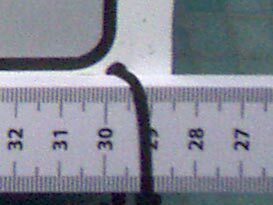 This results in a very small third-order radial correction coefficient ( b=0.005) to remove the residual pincushion distortion. This happy coincidence, incidentally, is probably accidental. Compact camera zoom lenses are not designed with underwater ports in mind, and other cameras will not usually turn out to be rectilinear underwater. The flat port moreover, does introduce some chromatic aberration (as it must), and this combines with the residual aberration of the zoom lens to require shifts in the first-order (d) coefficients for red (-0.0005) and blue (+0.003) relative to the green (reference) channel. Zoom setting full wide. 35 mm equiv. f = 35 mm. Underwater lighting: ikelite DS-125 with 4100.6 slave sensor / EV controller. 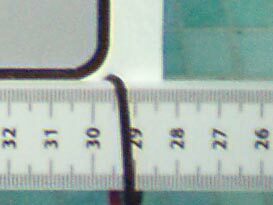 Corner details of pictures taken with the μ410 are cropped from the full-size 2272 × 1704 pixel image. Flat port, underwater (corner detail has been WB corrected). The 6138.4 is an example of an ikelite miniature compact housing from 2004 (pre-dating the Ultra Compact). 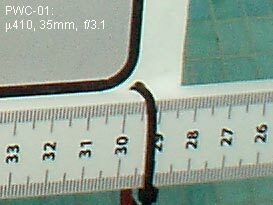 It had a front port body of 2.2" outside diameter, but the 2004 version had no provision for the attachment of wide-angle (or macro) supplementary lenses. Larger ikelite compact housings of the time had a 3" diameter port with an M67 filter thread, but it was perhaps thought that people would be less interested in using supplementary lenses with the then-new high-performance miniature cameras. Olympus however, had no qualms about providing a filter thread on its PT housings for μ-series cameras, and the wide-angle results were very good. 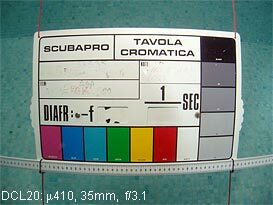 The μ410 was included in these tests as a way of showing just how good the results could be with a fully-automatic digital point-&-shoot. 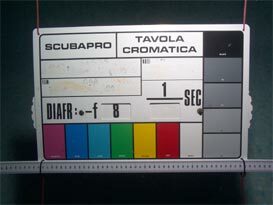 In other words, it was an oblique way of telling people that it was time to ditch their underwater film cameras and go digital. 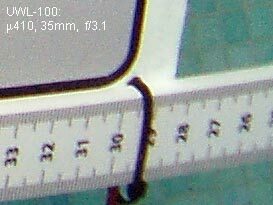 To that end, we might simply have screwed an M46 wide converter to the port of the Olympus PT-016 housing, but we also wanted to persuade ikelite to make provision on its miniature housings. A particular design issue at the time was that an M67 thread offered the greatest choice of add-on lenses; but some people also wanted to use the built-in flash, which would be permanently blocked-out if a 3" port was used. The solution would be a removable M67 port-adapter. For the purpose of the test using the ikelite housing, it was, of course, necessary to improvise a port adapter. This was done by bolting the M67 lensholder ring from an Epoque lens-mount adapter to an Ultralight AD-SS YS-mount adapter. This gave a lensholder that could be attached to a short ball-joint arm, which was mounted on the accessory shoe on the top of the housing. To permit slave triggering of an external flash without light from the internal flash leaking into the back of the supplementary lens, a black rubber light baffle (cut from an old car-tyre inner tube) was fitted around the housing port. The hole in the baffle was cut 2 mm smaller than the port diameter, to make a stretch-fit so that the baffle would adopt the shape of a funnel. Wide-lenses were tested with the back-surface pressed against the port, although, since all of the lenses were easily capable of covering the camera's FOV, a gap of a few mm would have been tolerable. 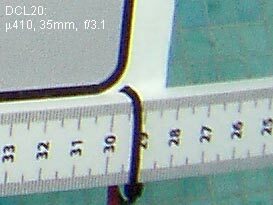 Ike Brigham (late lamented founder of ikelite Inc.) was suitably impressed by the results we obtained and subsequently arranged for the design and manufacture of a range of 2.2" port adapters (allowing either Inon AD or M67 lenses to be fitted). 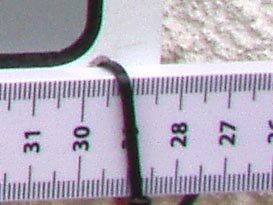 Post 2004 versions of the ikelite 2.2" port have a groove for retention of the adapter, and also, where possible, an M46 filter thread. The lensholder improvised for these tests is incidentally nowadays available in the form of the Inon M67 lens arm (see right). The device is also particularly useful for making LCD magnifiers. 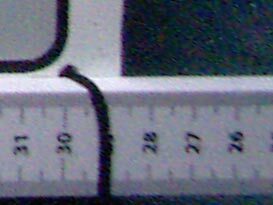 Dimensions /mm: 102 Ø, 59 long. Weight: 650 g.
Max. FOV without vignette: 100°. Weight: 460 g in air, 280 g UW. 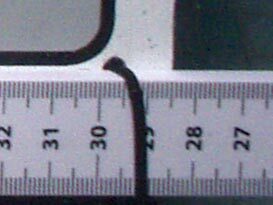 Dimensions /mm: 93 Ø, 53 long. Weight: 650 g in air / 400 g UW. Dimensions /mm: 99.4 Ø, 59.5 L.
Configuration: 5 elements, 4 groups, AR coated. Materials: Optical glass lens, Al alloy body. 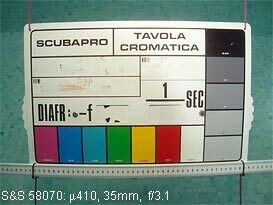 (when camera lens 35 mm equiv: focal length is 31.5 mm). Configuration: 5 elements, 4 groups, optical glass. Afocal. Achromatic. AR coatings front & back. Dimensions /mm: 100 Ø, 58.5 L. Weight: 625g in air, 370g UW. Dome port forms sealed air cavity in front of UWL-100 Lens. Max. 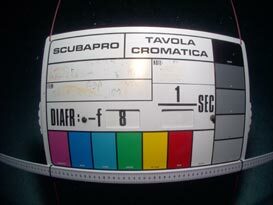 coverage without vignetting: 131° underwater (when camera lens 35 mm equiv: focal length is 31.5 mm). Materials: Optical glass dome with internal multiple anti-reflection coating. Anodised Al body. Dimensions /mm: 129.6 Ø. L = 48.9 dome unit only, 85.5 with UWL-100. Weight: 498 g dome unit only (air). 587 g UW with UWL-100. Olympus C-5050 camera. Zoom: 35mm. 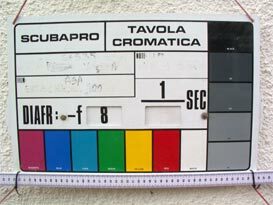 Aperture: f/8. 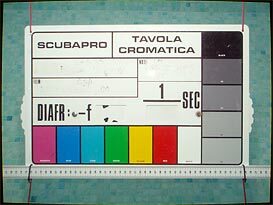 Note that, due to the 128° FOV of this lens, the camera is extremely close to the test card. The apparent loss of edge resolution is due to curvature of field, and will be largely compensated by depth of field at greater distances. 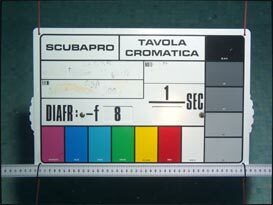 Note that the coefficients are always adjusted so that a + b + c + d = 1 in the green (reference) channel. This ensures that the image height remains unchanged by the correction. 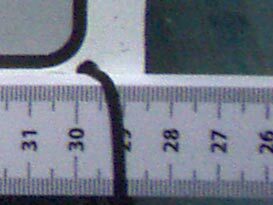 A measure of the image geometry is given by the figure a+b+c, where a positive value indicates pincushion distortion, and a negative value indicates barrel (fisheye) distortion. 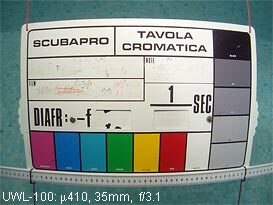 For the lenses, in each case, note that the values given correspond to lens + camera, so it is necessary to subtract the figure for the camera to get a figure for the lens. 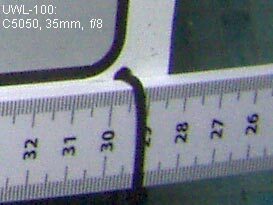 From this, we can see that the Sea&Sea lens (now sadly discontinued) is very nearly rectilinear, giving a figure of -0.03, of which -0.02 is attributable to the camera lens. The Inon UWL-100 with dome, on the other hand, is a serious fisheye, as is to be expected for a lens with such an extreme FOV. 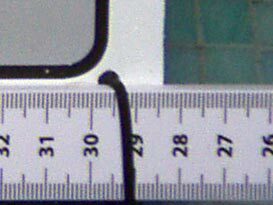 An important function of any wide converter is to correct for the efects of the water-air boundary. If the converter is successful in in this respect; and assuming that it is of an achromatic design (so that it corrects for dispersion in the glasses used to make it) then the residual aberration should look like that of the camera. Note however, that the coefficients obtained by working with a 5M pixel image have an uncertainty of about ±0.0005. If the result comes out better than the camera, then it is a happy coincidence, but it won't be reproduced when using a different camera. 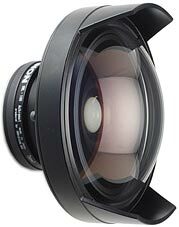 If we leave the Inon lens with the dome aside; there is little difference in performance between the four remaining lenses. The Sea&Sea lens showed the best rectilinear correction, as mentioned above. The UN PWC-01 has the least chromatic aberration, but all provide considerable improvement over the uncorrected lens port, and the other lenses offer a greater angle of coverage (lower magnification). The Epoque DCL-20 and Inon UWL-100 are practically identical in behaviour, except that the Epoque lens gives slightly greater coverage . There is no great reason to favour any one of these 35M67 lens over another; except on the basis of price or availability (In 2004, the Epoque lens was cheapest, the Sea&Sea lens was discontinued, and the UN lens was hard to get in the UK. 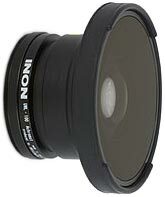 ); or (in the case of the Inon lens) for the ability to accept an add-on dome in order to achieve super-wide coverage. Overall, all of the lenses provide substantial improvement over the bare port and do their jobs well. The results obtained using the μ410 camera do not give a great deal of additional information about the lenses except to indicate that there is a small penalty in corner image sharpness for using an aperture of f/3.1. Worth noting however, is the remarkable image quality that can be obtained from a fully automatic digital camera. A final point that should be kept in mind however, is that both of the test cameras had only a 3× optical zoom range. 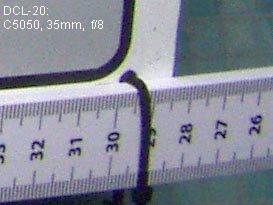 In recent years there has been a tendancy towards greater zoom range, and from an underwater photography perspective, this is not optimal. The problem is that super-zoom lenses change physical length radically as the focal length is varied, and are usually shortest at wide-angle settings. This forces the housing designer to place the port a long way from the camera-lens at wide-angle settings in order to prevent the lens from crashing into the port at telephoto settings. 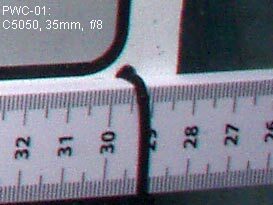 When using a wide converter, the effect of having the entrance pupil a long way from the port is to degrade optical performance even when no vignetting occurs. The main effect is an increase in chromatic aberration, and this will be visible in large reproductions. 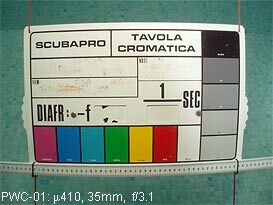 The solution, for compact camera users who want to produce exhibition prints or displays, is to apply computer radial correction. 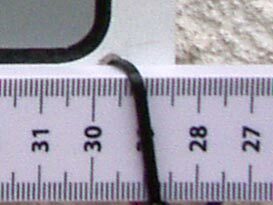 Users of interchangeable-lens cameras who wish to use an external wide converter are advised to adopt lenses of fixed focal length, or zoom lenses of limited range, and choose the shortest allowable port body. Photographs by David W Knight.